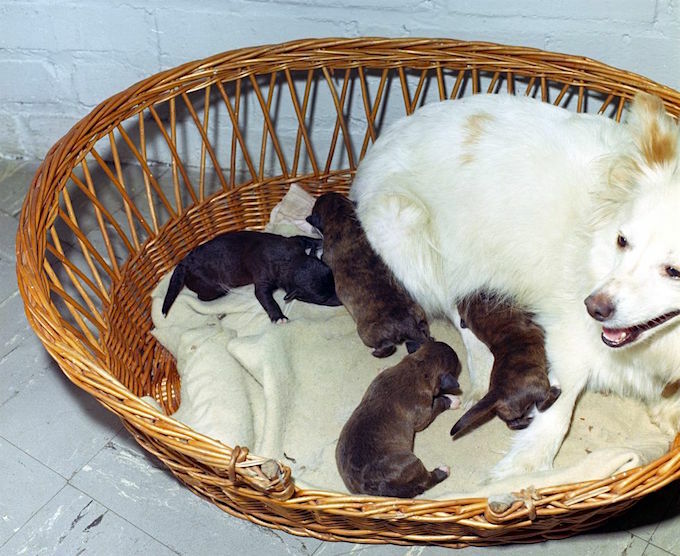 Pushinka and her puppies as newborns, June 18, 1963. During John F. Kennedy’s presidency, he received a gift from Soviet Premier Khrushchev: the dog Pushinka. Pushinka, after being checked out by the Secret Service to make sure she wasn’t bugged, soon settled into the White House with the Kennedy family. Pushinka was very welcome by one member of the family in particular: the Kennedy’s Welsh terrier, Charlie. The puppies — Butterfly, White Tips, Blackie, and Streaker — spent a great deal of time with the Kennedy family in the two months before they were adopted by other families. In fact, it was Carolyn and John-John who gave the puppies their names. Bryant even brought them to the Kennedy home on Cape Cod so that Caroline and John Jr. could see the puppies. When JFK visited the family compound on the Cape, he even enjoyed playing with the “pupniks” on the lawn. 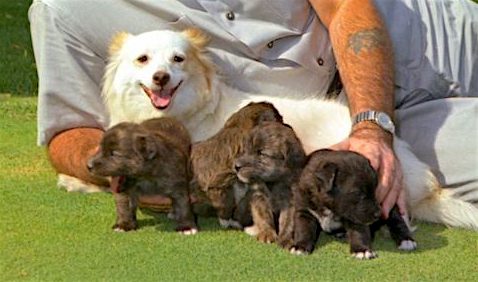 Pushinka with her four puppies, Butterfly, White Tips, Blackie, Streaker. July 9, 1963. When the puppies were born, around 5,000 people wrote in to the White House asking if they could have a puppy. Ten-year-old Karen House of Westchester, Illinois, was thrilled to adopt Butterfly. Nine-year-old Mark Bruce of Columbia, Missouri, won the First Lady’s heart with his letter detailing the accidental death of his former dog, and so acquired Streaker. The First Family didn’t just send the puppies off; they paid for the expense of sending the puppies to their new homes and even included a dossier explaining Butterfly’s and Streaker’s preferences and habits. The other two puppies were later given away to family friends. Descendants of these famous pups can still be found today.